I used to love to own books. Everytime I went to the bookshop, I would buy 4 or 5. I can’t bear to throw them or give them away – even the crap ones. I have no space in my house for any more books. Georgina doesn’t see the point. She goes to the library to get books and takes them back when she has read them. A couple of years ago, I signed up for BookCrossing. The idea is that when you are done with a book you set it free – you just leave it in some public place and put a note on the web site (Bleak House. 3rd bench on the left, Liberty Park, My Town). I never actually set any books free because I couldn’t let go. The will to own them was too great to overcome. With movies, the opposite is true. I have very little desire to own them; I rent them on PPV or through Netflix instead. They cost about the same as books and the reading/viewing frequency is about the same for books/movies. Why do I want to own books but not movies? Makes no sense to me. Anyway, in my life so far I have always wanted to own music. With the switch from vinyl to CD, I felt a little bit cheated that the old format was obsolete but I ploughed on anyway. The final straw was when my old car died and I was left with a bunch of cassettes that I could no longer play. My friends tell me I could transfer all those old songs to some new-fangled format. If they were proper friends they would know why that is not gonna happen. Other friends tell me I could I buy them again in some other proprietary format but that was probably before they read the previous paragaph. As of today, I no longer want to own music. I am going to rent it. 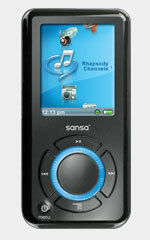 I just bought a Sansa Rhapsody and from henceforth, I will listen to all the music in the world for $15/month. The only problem I have now is what to do with all those CDs and LPs cluttering up my living room. Perhaps I will keep them as a reminder of how we used to own music back in the 20th century. 1st: Grats on the new toy. New toys are always cool! 2nd: Sorry that you went the cheesy way. If music is important to you, then what music you own and cherish defines you. You are not what music you listen to on radio (or rhapsody). Instead you are the music you own. Books is the other way, you are what you read, not what books you have bought. A little like movies. I think the reason is that you’re supposed to read a book once or twice, watch a movie once or twice, and listen to the music you like hundreds/thousands of times, and then you should own it. 3rd: Rhapsody is to pop music culture, what an all-you-can-eat buffet is to cuisine. Great if you’re starving, no place to bring a date. Just my opinion, and I’m very happy that for once, I’m not tempted by a new toy. Also, I was going to say that I hope you’re wrong about renting music is the 21st century way, but actually I don’t really care either way, as long as I can still buy and own music.